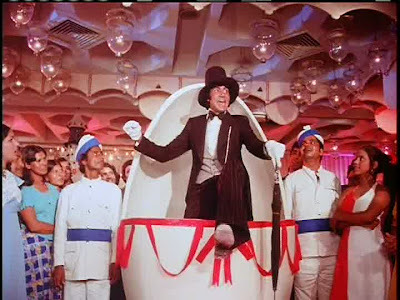 70s Hindi films are a magical span of time and space and talents in which a very tall man in a top hat, white gloves, and a monocle pops out of a giant Easter egg decorated with crepe paper letters spouting nonsensical English to swaying, almost samba-ing brass, strings, and piano - in a geometric-ceiling'ed room full of colorfully-attired merry-makers dancing like totally normal people who can hardly believe their good fortune to be in the presence of such silliness. And that's just one song in one film! That one glorious moment doesn't even touch on Shashi, Neetu, Rakhee, Vinod, Helen, and Pran! Or dizzying wallpaper and bright yellow bell bottoms and roller skates and villain lairs and giant record players you can dance on! Or separated siblings and temporary blindness and drunk raving on the top of a water tower and children left at the foot of statue of Gandhi on Independence Day! The man popping out of an Easter egg wearing a monocle spouting nonsense and dancing with awe-inspiring comic moves is just the tip of the iceberg! This is not to say that there aren't horrible films from the 70s. There certainly are. But even those seem to be made with bigger grins and bigger hearts - or at least an honest-to-goodness sense of fun - than the bad movies I have sampled from subsequent decades. That's why I'm so excited about 70s week. I cannot wait to see what all the participants choose, interpret, and share. We've got Masala Recommended Allowance of digital communication: blog posts from about 20 people, tweets (including Gabbar Singh - follow at @GabbbarSingh [yes, the 3 Bs are intentional]) (and if you use twitter, the hashtag #70sweek will help us organize), a youtube channel, and a web radio show! All we need now is a helpful anipal delivering messages rolled up in its collar (or at least for Sheroo to become the twitter icon for the week).... Anyway. I hope everyone has as much fun as I'm having, and if we manage to delight readers enough that they test the waters of 70s films, our symbolic collective Maa (Nirupa Roy, of course) will shed more than a few tears of joy. I am so excited!!! Can't contain the happiness... you have no idea how at a perfect time you've planned this. Thanks so much, Beth!!! I'll be youtubing it until my Netflix arrive on Tuesday or Wednesday. Looking forward to trawling for 70s Bollywood fab! I moved the '70s movies to the top of my Netflix queue. This is such a fun idea! I have no idea to add the hash tag to my automatic Twitter post-feed...sorry :( If you can edumacate me on that I'll do it. I'll have what they're having. My Name Is Khan: "well, we've been Joharred"
Look what came in the mail!